Marantz unveils 2016 home cinema line-up | What Hi-Fi? Marantz has unveiled three home cinema amps for 2016, including the first Marantz amp to feature HEOS multi-room technology. The 9-channel SR7011 offers 11.2ch processing with 13.2ch pre-out, and is capable of Dolby Atmos 7.1.4, as well as supporting DTS:X and Auro 3D formats through forthcoming firmware upgrades. Connectivity is covered by eight HDMI inputs, each with support for 4K 60Hz passthrough and HDCP 2.2 compatibility, alongside 3 HDMI outs. There are plenty of legacy connections too, including three each for component and composite video ins and one each out. You can expect high-res music playback support – both PCM and DSD – alongside AirPlay, Bluetooth and Spotify Connect. As previously mentioned, HEOS is also included here, meaning the SR7011 can form part of your multi-room system. It’s due in September for £1400. Sitting just below the SR7011 is the SR6011, which is also a 9-channel amp with 11.2 processing and 13.2 pre-out, but with slightly less power at 185w per channel. Connectivity is very similar too, with eight HDMI ins, but you'll only get two HDMI outs here instead of three. HEOS won’t feature on the SR6011, but you will get the Atmos and DTS:X support, plus high-res music playback, Bluetooth, Spotify Connect and AirPlay are all included too. It’ll be available for £1000. 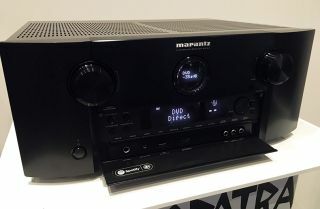 Marantz is known for its slimline AV receivers, and the NR1607 is this year’s model. It’s a 7-channel receiver with 90w of power per channel, packing support for 5.1.2 Dolby Atmos and DTS:X via a firmware upgrade. Connectivity is covered by eight HDMI inputs with HDCP 2.2 compatibility, and one out, plus three each of analogue, composite and component inputs. It’s available now for £600. Finally, the popular Marantz AV8802 home cinema pre-amp has a more affordable sibling on the way, in the AV7702. The 11.2ch pre-amp has both balanced and unbalanced outputs, with eight HDMI ins, three outs and all the Dolby Atmos, Bluetooth and HEOS support of the SR7011. It’ll launch in November for £1700.